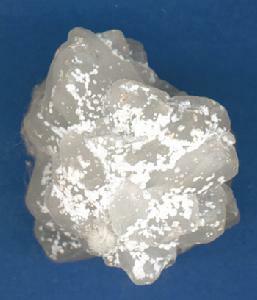 The extracted and refined crystal of natural borax mineral. Mainly in Qinghai province and Tibet Autonomous Region of China. Mined and made during whole year. No bad smell, sweet and slightly salty taste. Greenish white, pure and semitransparent. Sweet, salty, cool; lung and stomach meridians entered. Clear heat and remove toxicity for external application, clear lung and resolve phlegm for internal application. It is usually indicated in laryngological and ophthalmologic diseases and mostly used externally for its actions of clearing heat, removing toxicity, relieving swelling, preventing corrosion. For swelling and pain in the throat, sores on the oral mucosa and the tongue, it is reinforced by combination with toxicity-removing and swelling-relieving herbs. For instance, it is combined with Bing Pian, Xuan Ming Fen and Zhu Sha in Bing Peng San from Wai Ke Zheng Zong. For blood-shot eyes with swelling and pain, it can be used singly to wash eyes with its water solution. It also can be indicated with vision-improving and nebula-removing herbs to obtain the actions of clearing heat, relieving swelling and improving vision, such as Bing Pian , Lu Gan Shi. Zhen Zhu and Xiong Dan to grind into powder for eye drop application. It can he indicated for phlegm-heat cough for its action of clearing lung and resolving phlegm. It is suitable for treating cough accompanied with swelling and pain in the throat because of its action of removing toxicity and relieving swelling. In clinic it is usually indicated with lung-heat-clearing herbs to obtain the actions of clearing heat and resolving phlegm and removing toxicity and relieving sore throat, such as Xuan Shen, Zhe Bei Mu, Gua Lou and Huang Qin, etc. Take proper dose for external application, grind into extreme fine powder for direct use or mix with other liquid, or gargle it with water. Take powder or pills l.5~3 g for internal application. It is mostly indicated for external application. Ir should be used with cautions for internal application.